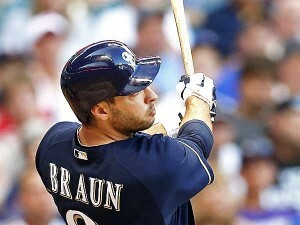 The Milwaukee Brewers put outfielder Ryan Braun on the 15 day disabled list following a 4-3 loss to the Cincinnati Reds on Friday night. Braun had missed the last four games with a sore right thumb and attempted a batting practice session that did not go well. The Brewers are hopeful Braun will be able to return as soon as he is eligible. It was then that the decision was made to place Braun on the disabled list. Caleb Gindel will replace Braun on the roster. Gindel is hitting .274/.341/.456 with Triple-A Nashville this season.